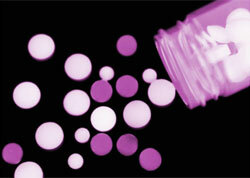 Effective cancer therapies offer patients longer survival times. Unfortunately, common therapies such as chemotherapy are toxic to immature eggs that are housed in round structures in the ovary known as follicles. Girls and young women who receive life-saving cancer therapies may diminish or lose their ability to conceive children in the future. Infertility in female cancer patients may also reduce their quality of life. Doctors can offer few options to treat their infertility using current methods. For example, pre-pubescent girls are not mature enough to undergo ovarian hormone stimulation to collect eggs that can be frozen for later use, and the procedure is dangerous for older women with estrogen-positive breast cancer. New approaches are needed to restore fertility in female cancer survivors. The Common Fund’s Interdisciplinary Research program supports an Oncofertility Consortium that is developing new technologies to restore fertility in female cancer patients who may become infertile because of treatment. The investigators have engineered a novel, three-dimensional cell culture system that allows human follicles containing immature eggs to grow into mature follicles and eggs that could then be used in fertility treatments. Girls and young women can donate ovarian tissue containing the immature follicles prior to beginning cancer treatment. 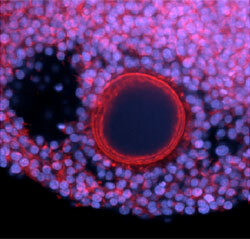 The follicles can be grown into mature eggs in vitro and used to restore fertility when the time is right to conceive. The Common Fund’s Human Microbiome Project is generating interest in bioengineered therapies based on probiotics, dietary supplements or foods that contain beneficial or ’good‘ bacteria similar to those normally found in the human body. Although people do not need probiotics to be healthy, these microorganisms may provide some of the same health benefits, such as improved digestion and protection against harmful bacteria, produced by bacteria already existing in the body. The national debate on ethical and social considerations for using probiotics has focused on “over the counter” applications in which doctors are not typically involved in the selection and use of the probiotic. While new probiotic therapies are becoming increasing common among caregivers, little is known about how patients perceive these treatment options. To be successfully integrated into patient care, we must understand patient attitudes and beliefs about treatments involving bioengineered probiotics. ​​ Sharp RR, Achkar JP, Brinich MA, and Farrell RM. Am J Gastroenterol. 2009 104:809-813. ​Stem cells offer enormous potential for repairing damaged tissue but historically they have been hard to obtain. Recent discoveries have shown that normal skin cells can be induced to form stem cells. This provides a readily available source of stem cells, but it’s not known if these “induced” stem cells are really equivalent to embryonic stem cells, or if the range of adult cell types made from them are normal and could be used for therapeutic purposes. An important step to answer these questions is the development of “fingerprints” of all cell types. Chemical modifications to DNA occur in different patterns in each type of cell. These modifications serve as one type of molecular fingerprint that defines what makes a liver cell a liver cell vs. a heart cell vs. a neuron vs. a “pluripotent” stem cell that has the potential to become any one of these cell types and more. To understand how an embryonic stem cell differentiates to become any type of cell in the body, we need to decipher its molecular fingerprint. We also need to know if induced stem cells have the same molecular fingerprint as embryonic stem cells. 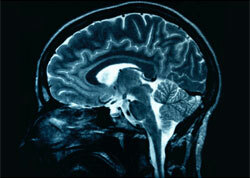 Researchers in the Common Fund’s Epigenomics Program have taken the first step toward this goal. They have determined a high resolution fingerprint of one type of chemical group on the DNA of human embryonic stem cells and have compared it to what is found in fibroblasts, a type of cell found in many tissue types, including skin. They found that the fingerprints varied drastically between the two cell types. In addition, an analysis of limited regions of DNA from induced stem cells yielded a partial fingerprint that showed the same characteristics as in human embryonic stem cells. This discovery yields fundamental knowledge about stem cells and indicates that induced stem cells are molecularly similar to embryonic stem cells. It provides a method to identify cells as stem cells, and it is important for future work in which these cells will be used to regenerate adult tissues. ​ Lister R, Pelizzola M, Dowen RH, Hawkins RD, Hon G, Tonti-Filippini J, Nery JR, Lee L, Ye Z, Ngo QM, Edsall L, Antosiewicz-Bourget J, Stewart R, Ruotti V, Millar AH, Thomson JA, Ren B, Ecker JR. Human DNA methylomes at base resolution show widespread epigenomic differences. Nature. 2009 Nov 19;462(7271):315-22. Epub 2009 Oct 14.PMID: 19829295. 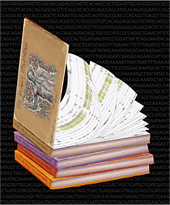 The completed human genome sequence has been metaphorically described as “the book of life. Expanding upon this metaphor, the map of the epigenetic DNA modifications that adorn the human genome in one cell may be regarded as a single volume in the vast encyclopedia of epigenomes that may be found within the human body. The volume cover depicts a mosaic of an anatomical drawing of a human torso taken from the book “De humani corporis fabrica” (On the Structure of the Human Body) by Andreas Vesalius (1514–1564), who is often regarded as the founder of modern human anatomy. The mosaic is composed of the letter C, which represents the methylcytosine bases identified through shotgun sequencing of bisulfite-converted human genomic DNA, in which only methylated cytosines were not converted to uracil. Together this forms a graphic portrayal of the first comprehensive DNA methylomes of humans, constituting the first two volumes of the potentially vast “Encyclopedia Epigenetica”. Cover image by Ryan Lister. Letter C images: Leo Reynolds, chrisinplymouth, Karyn Christner, Eva Ekeblad (www.flickr.com). Karyotype image: NHGRI Talking Glossary of Genetics. Brain cells have a receptor on their surface called the M1 muscarinic acetylcholine receptor that plays a role in debilitating neurodegenerative diseases such as Alzheimer’s disease and schizophrenia. Prior attempts to develop compounds other than the chemical acetycholine that exclusively target the M1 receptor have failed. The lack of alternative compounds that selectively bind the M1 receptor hampers our ability to study how the M1 receptor controls human behavior and biology and how it can be used to design new drug therapies for neurological diseases. Vanderbilt researchers supported under the Common Fund’s Molecular Libraries and Imaging program are using high-throughput screening approaches – testing large numbers of potential drugs – to identify potential new compounds for drug therapies that specifically bind to the M1 muscarinic receptor. To be effective, promising drug candidates must penetrate cells, are potent at extremely low concentrations, and show greater than 10-fold selectivity for M1 over other receptors in the muscarinic family (M2, M3, M4 and M5). The researchers have identified two promising compounds that selectively activate the M1 receptor and can reverse learning deficits in test rodents with few adverse side effects. Discovery of new compounds that specifically activate the M1 receptor gives researchers new research tools to understand how M1 receptors function in the central nervous system and to identify new therapies for neurological disorders such as Alzheimer’s disease and schizophrenia.